Another change to final-day Scottish Championship fixtures has been ruled out by league bosses despite opposition expressed by Falkirk. The Scottish Professional Football League announced on Monday that all five games would be moved back a day to Sunday, 1 May (12:30 BST). That came after BT Sport elected to show Rangers' trip to play St Mirren. And the SPFL says there "will be no change" to the decision after Falkirk said it would hurt clubs financially. "All Ladbrokes Championship clubs were advised last Thursday that live broadcast selections for round 36 would be published on 4 April and that, if a game was to be selected for live broadcast, all Ladbrokes Championship fixtures would be rescheduled to the live broadcast kick-off date and time," said a statement. "No comments were received from any club ahead of the announcement on 4 April of the rescheduling. "With the potential for St Mirren's result to have a bearing on final league places impacting on a large number of clubs, there is a clear need for a single kick-off time in the spirit of sporting fairness. "We announced this decision at the earliest opportunity, rather than delay, to give supporters as much notice as possible. "All of the final day Ladbrokes Championship fixtures will take place on Sunday, 1 May with a 12.30pm kick-off." Rangers are expected to have clinched the title and automatic promotion by then - and could do so on Tuesday when they entertain Dumbarton. Hibernian, who host Livingston on Tuesday, will join Falkirk and Raith Rovers in the promotion play-offs should runaway leaders Rangers clinch the title. St Mirren, who are 10 points clear of second-bottom Livingston in the relegation play-off spot, are in a strong position to have secured their Championship place for next season before the final day. However, they could also still overhaul Queen of the South and Greenock Morton above them, so the SPFL will argue that that their match against Rangers could still affect the final league positions. Promising that his club would be "protesting the decision", chairman Doug Henderson: "We understand why the SPFL wanted to change the dates so that all the final-day games took place at the same time. "The reality is that none of the teams competing for the play-offs would be disadvantaged by allowing their games to take place on the Saturday. "This decision is inconsiderate of our fans, not only because of the switch to a less convenient day but also because end-of season supporters' events have been planned for the Saturday. "There's still time to reverse their decision and respect the wishes of our fans." Falkirk host Morton on the final day and could still be in a race with Hibs for second spot, meaning later entry into the promotion play-offs, which start on 4 May. The Bairns have approached Raith Rovers chief executive Eric Drysdale, who sits on the SPFL board, and asked him to press the governing body for a change. 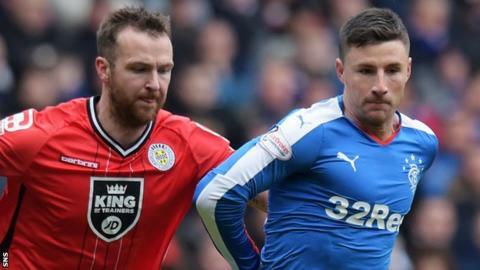 League bosses were criticised last season after Rangers' final game against Hearts was moved back 24 hours at 17 days' notice while the other four matches remained on the Sunday. Hibs, who eventually beat the Ibrox side to second spot, immediately complained that Rangers could gain an advantage while Hearts were angry over the disruption to supporters and consequences for "sporting integrity". The SPFL then moved all games to a Saturday kick-off despite strong opposition from Falkirk, who hosted Hibs on the last day.